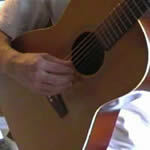 Learn finger picking with this Guitar Tuition DVD. This DVD explains many aspects of finger picking on a guitar, as well as demonstrating various finger picking techniques that will help to improve your playing in this area. The tutorials cover a range of finger picking styles including jazz, latin, spanish and lute style. Any questions you have about finger picking should be answered in this comprehensive DVD. • What are picking patterns? • Do I need nails? • Who should I listen to? • How do I syncopate my picking? • Can I use a plectrum as well as fingers? • What is dead thumb? • How to improvise while finger picking? • How do I keep my nails in good shape? • What is ragtime style?